Visit the visually spectacular ‘EpsonVortex’ and new AV solutions for signage, business and entertainment on Stand H90, Hall 1. 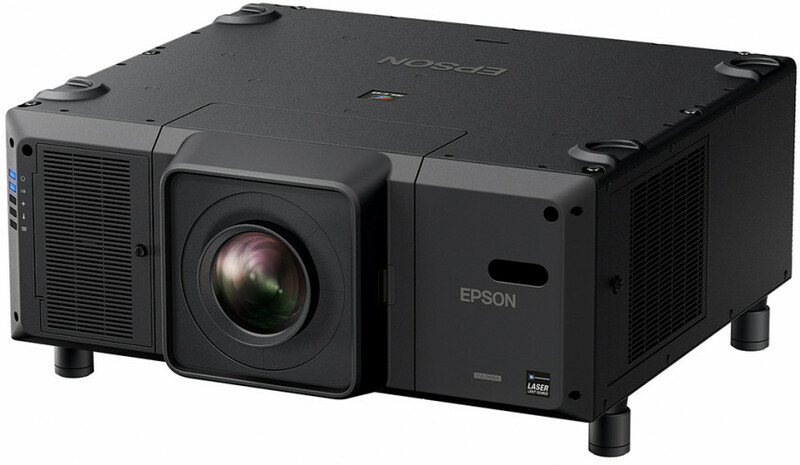 5 February 2019 –On the opening day of ISE 2019 Epson will showcase its new 30,000 lumens laser projector (the EB-L30000U) ahead of its official launch in 2020. This high-end installation laser projector is aimed at rental and staging companies, hospitality markets and visitor attractions. Epson will unveil its latest range of fit-and-forget, compact, installation laser projectors, the EB-L1075U, EB-L1070U and EB-L1050U. These are Epson’s most affordable and versatile installation projectors, complete with 4k enhancement and supporting interchangeable lenses. Designed for large venue usage: from visitor attractions to lecture theatres, museums to meeting rooms, they produce bright (up to 7,000 lumens), detailed, vivid and powerful images. The minimalist, discreet design and quieter fan noise ensure they fit seamlessly into a wide variety of environments. Also being introduced at ISE is the EB-U50, a stylish and tough signage projector, which has a low total cost of ownership (TCO). Designed to captivate an audience by illuminating and projecting on virtually any surface, the EB-U50 has been designed to be space-friendly and unobtrusive. It can be used as a projector or a spotlight, and is ideal for shop window displays, retail showrooms, dynamic or experiential content for digital art, commercial signage, décor, education or corporate presentations. #EpsonVortex is this year’s show-stopping, on-stand, 360 degree ‘kinetic portal’ visitor experience. It not only transports you to the heart of the experience, but makes you a part of the installation. Each trip through the EpsonVortex is unique. Epson has employed 16 double-stacked EB-L1755U laser projectors with ELPLU03 lenses and a custom 4D soundtrack using multichannel audio. Visitors will become part of this unique installation as, when entering the portal, each person is mapped using a laser matrix with real time visuals creating an ever-changing spectacle that responds to an individual’s every movement. Additional highlights on the stand include a demonstration by the UK’s National Theatre of its newly launched smart caption glasses designed for people with hearing loss. The smart caption glasses use Epson’s Moverio augmented reality smart glasses to provide theatre goers with real-time synchronised transcripts of dialogue directly onto the lenses of the glasses. It means that people with hearing loss can now follow the action without taking their eyes off the stage. “Augmented reality is fast coming of age, with many applications now moving from proof of concept to mainstream implementation. Our work with the National Theatre is a wonderful example; showing how smart glasses can assist people who are hard of hearing, making theatre more accessible, and is one of many useful applications across a diverse range of sectors from retail, healthcare and education to repair and maintenance, entertainment, museums and visitor attractions.” says Valerie Riffaud Cangelosi, Head of New Market Development – Epson EMEA. You can experience the latest in Epson projection technology at Stand H90, Hall 1at ISE 2019. Use #EpsonISE19to join the conversation.